It is like nemesis is catching up with suspected ritualists in Ogun State trading in human body parts. No week passes without the police in the state arresting a suspected ritualist. In the latest onslaught against them, no fewer than seven were arrested. The state Commissioner of Police, Ahmed Iliyasu, in the meantime, allayed the fear of residents, saying security agents would not be tired of arresting suspected ritualists. Iliyasu was speaking on the arrest of the seven suspects who allegedly operated in three syndicates and apprehended by men of the Federal Special Anti-Robbery Squad. The first syndicate was said to have comprised of two suspected members, Lateef Aremu (67) and Kola Sodipo (32), who allegedly specialized in purchasing and exhuming corpses for money ritual. According to the police boss, men of the Federal Special Anti-Robbery Squad arrested Aremu and Sodipo after receiving information about ritualists who specialised in using human parts. “The Federal SARS received information about some ritualists who specialised in using human parts for ritual purposes. So, based on the information, a team was sent to track them down and the effort was successful when two members of the syndicate were arrested at Owode-Egba area of the state”, Iliyasu said. “ Kolawole Sodipo and Lateef Aremu were arrested. Recovered from them were human skulls and bones, as well as six live cartridges”. Speaking with Sunday Vanguard, Aremu confessed that he used human parts to prepare various charms for people, adding that the business had provided him the financial muscle to acquire 15 cars and four houses. Aremu, who claimed that he was a farmer and herbalist, did not deny that he used human parts to make charms for people. He said the human skull he was allegedly caught with by the police was brought to him by his colleague for money ritual. “I am a farmer and an herbalist. We were doing a foundation in Itoko where I wanted to build a house; there, we saw these bones and we packed them inside a bag and that is all. However, when we wanted to do money ritual, he brought a dry skull for the purpose”, the suspect said. “What we did was to grind the skull and add other ingredients, including a white dove and local soap. It has been up to 20 years since I have been in the business. I don’t use human parts all the time. I only do once in a while. “I have built four houses and bought up to 15 vehicles since 1980 when I started this business”. Sodipo, 32, while explaining his role in the syndicate, said, “I am a farmer. I know baba (Aremu) to be an herbalist, because he usually comes to see my landlord. I also trained as an herbalist. “Someone came to me requesting for money ritual and I directed him to baba who negotiated and collected N75, 000 from the client but the ritual failed. The man called me to complain and I asked him to collect his money. He wasn’t ready to collect the money, he wanted it repeated but it failed again. “I didn’t know anything about the skull. I didn’t take any skull to him. I only specialized in working for petty traders to boost their trade”. The N12, 000 human parts’ transaction The police boss said that when the second suspected ritualists’ syndicate was raided, Adebayo Mudasiru and Rashid Abass were arrested with dry and fresh human parts, including human skull, flesh, teeth and four lizards in Totoro area of Abeokuta, the state capital. Iliyasu stated that Mudasiru and Abass were sighted with a suspicious bag and, upon interrogation, the items, which also included reptiles and assorted charms, were recovered. He alleged that the suspects were serial killers. “They specialised in killing people for the purpose of using human parts for rituals. A team of Federal SARS sighted two men on motorcycle with a suspicious bag and were forced to stop and be searched. “Recovered from their bag were fresh and dry human parts. On interrogation, it was suspected that the men are serial killers with their base at Totoro in Abeokuta. They are Adebayo Mudasiru and Rashid Abass. Dry and fresh human parts, human skull, some reptiles and assorted charms were recovered from them.” Speaking with Sunday Vanguard, Mudasiru, 36, who claimed to be an Islamic cleric, said it was one of their former teachers who sold the human parts to them. He said they bought the human flesh, skull and about 12 teeth for N12, 000. “We were coming from Itoku to buy some of the ingredients. We didn’t buy the human flesh at Itoku; we collected them from someone in Ijemo area of the town”, the suspect said. “We were aware of the contents; human parts are used for money rituals. We actually wanted to use them for ourselves, to draw people’s attention to us and we have been in this job for about five years. “We bought the parts from a cleric; the teeth are not costly. I don’t know how many but we bought them for N2, 000; we bought all the human parts, including the skull and flesh, for N12, 000. “We went to an Islamic school in Ijaye area of Abeokuta and we have been doing this, though we didn’t learn this in the Islamic school. What we do is to burn the human parts, mix the charred remains with local soap and snail water and use it to bath. We haven’t done it before but that is what we were taught. We were taught to mix lizard, human parts, snail water and other ingredients, we don’t really know how the charms function but that is how we were taught”. On his part, Abass, 33, said: “It is the person who gave us the ingredients that gave us the human parts. He is the one who taught us the way to use them and it is for money ritual. It is the same day we collected it that we were arrested”. The police claimed to have arrested a third member of the suspected syndicate, Razaq Adenekan, 42, shortly after the first two members were apprehended. 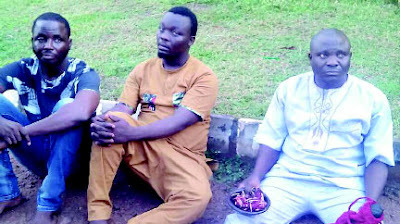 Cemetery attendants trade in human parts The third suspected syndicate allegedly had two members, Jimoh Olarenwaju and Babatunde Seun, both of whom reportedly worked as cemetery guards, and they confessed to have sold human heads for N10, 000 each. Iliyasu said the suspects were arrested at Oke-Yidi cemetery, Lantoro, Abeokuta, while digging at a burial ground. Speaking with Sunday Vanguard, Olanrewaju, the suspected leader of the gang, said they sold four human heads for N10, 000 each. “We didn’t break into caskets to remove corpses. What we did was to dig the ground and found human corpses that had been buried”, he said. “Some graves, which were not concreted and did not have identity, were the ones we got them from. These graves are usually difficult to know. But when we dig, we may not know if there is a grave or not. 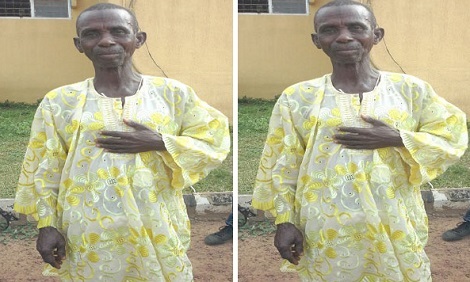 “I sold one human head to a deceased alhaji who was an Islamic cleric, also known as Alfa. He lived at Tinubu Street in Abeokuta North Local Government Area. He didn’t tell me what he wanted to use the human head for. “All the evil things I have done in this life, I believe, was during a period of ignorance; all what we did was done in ignorance”. » See how the human body would have to be built to survive a high-speed car crash. » See how human body would have to be built to survive high-speed car crash.